The most overlooked part of my pepper patch is the four cayenne plants on the end. They are scrawny compared to the rest of them, but they are in many ways the most powerful. No other pepper is hotter (in my garden anyway). I sometimes will cut fresh ones up into very thin rings to garnish some mundane steamed vegetable, but the main use is to be dried, crushed, and shaken onto a slice of pizza. I’m pretty sure it’s against the law to eat a slice without crushed peppers. Your choice (should you want to stay within the law) is to go to the Dollar General and buy a plastic jar of crushed peppers for, well, $1.00, or to grow your own. I’m here to tell you that growing your own is the only way. Let’s face it, you take great pains to find the best pizza around. Why on earth would you sprinkle inferior crushed pepper flakes on it. Cayenne peppers are cool looking. They are long and gnarly. Given time, they will turn a brilliant red. I wait until they are bright red to pick them. They grow slowly relative to the other peppers. I seem to hit a peak by the end of August. When I get enough ripe, into the dehydrator they go. 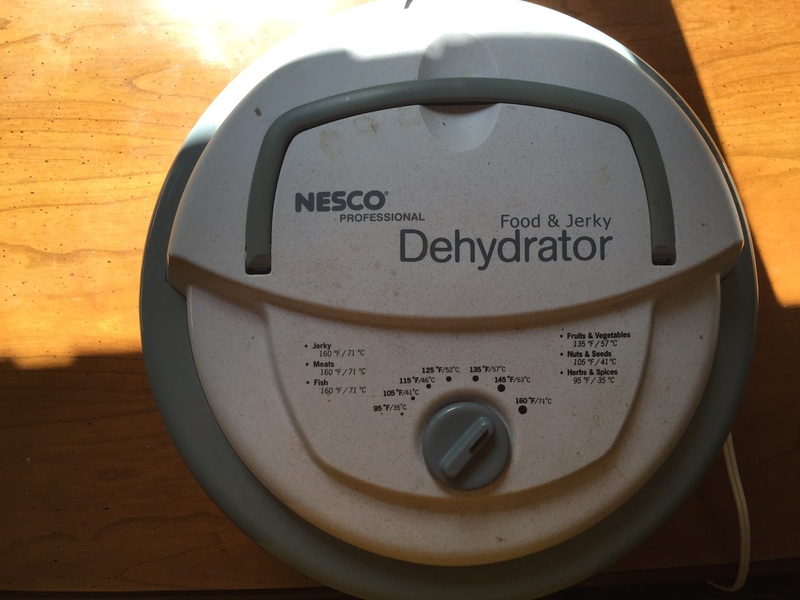 Dehydrator. If you don’t have one, get one. You don’t need to do a thing by way of preparations. Just put them in, and plug it in. 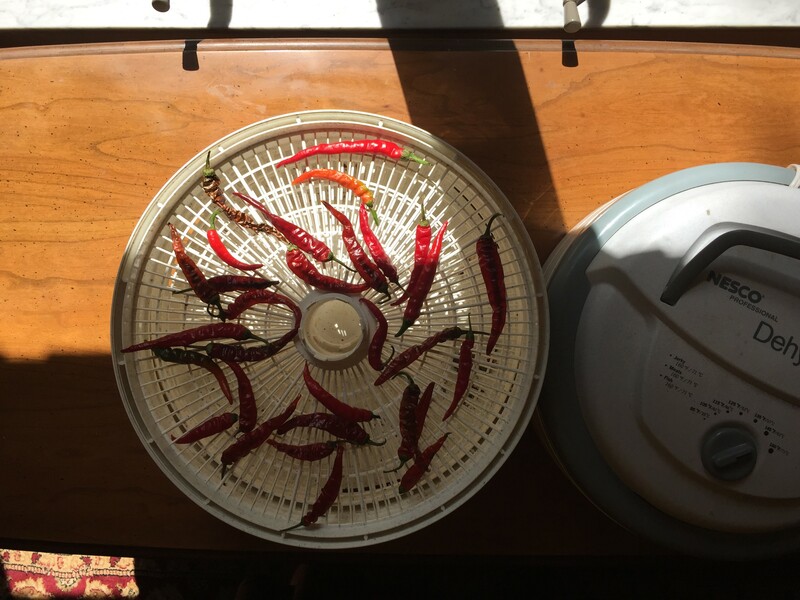 In about 2 days, you’ll have perfectly dried peppers. Dried and ready to be crushed. Once dried, you put them into a food processor and crush them. The good thing is that you can dry them in batches and keep them in ziploc bags until you have enough to crush and fill bottles. I go to the dollar store and buy shaker bottles for, well, $1.00 (sense a theme here?). If I have a lot of peppers, I fill a lot of bottles. Put a nice decorative sticker on it, and you have HANDMADE Christmas presents that cost you, well, $1.00 each. 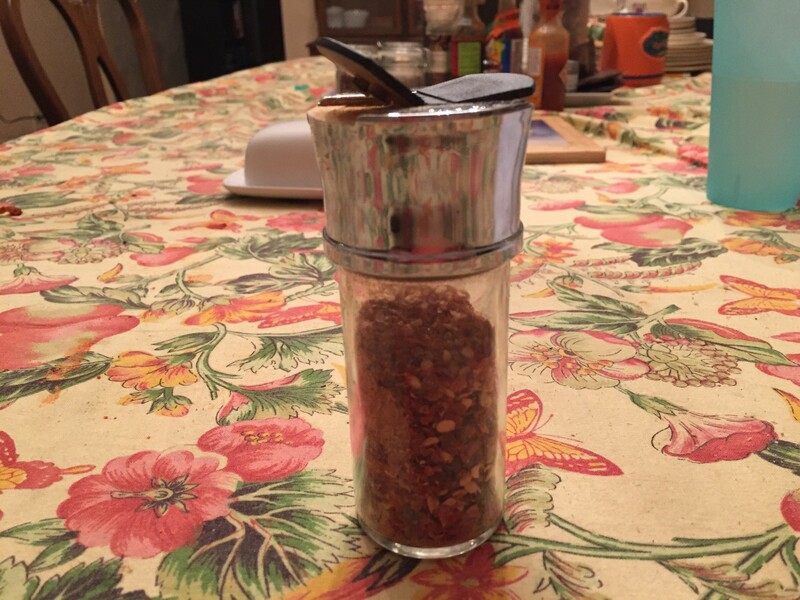 The taste of fresh picked, dried, and crushed cayenne can’t be compared with store-bought. So everyone will love your gift even thought you were so damn cheap. The sweet spot is where they love your gift, and it cost you practically nothing. But don’t tell anyone in my family.